Uzbek palov is the meal of real connoisseurs of the Eastern cuisine. None of the events in Uzbekistan is held without cooking palov. The Uzbek national cuisine has more than 100 recipes of Uzbek palov, and the technology of its preparation has been perfect for many years. 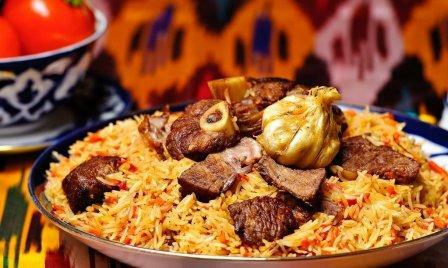 Each region of Uzbekistan is characterized by its method of cooking Uzbek palov. In Uzbekistan there is the ancient legend about origin the word “palov osh”, it is connected to Abu Ali ibn Sino. Long ago the prince fell in love with a beautiful young girl from the poor family. He suffered that could not get married to her. The prince began to wane, he refused to eat meal and water. Then his father invited the famous healer Abu Ali ibn Sino and asked him to find out the reason and recover his heir. Having examined the prince, ibn Sino knew that the reason of the sickness was love. He said that there were two ways to recover the son of the padishah. The first variant is to join the hearts of two lovers, and the second one is to feed the prince with the high-calorie dish – “palov osh”, the dish that is cooked from seven ingredients. Most probably, that the compulsory presence of this national dish on weddings is connected exactly to this legend.